In honor of National School Counseling Week, we are highlighting our school counselors throughout the week. At Lennox Middle School, no day is a boring day. From individual counseling to conflict resolution circles and scheduling students, Aura Martinez, Diana Jimenez, and Carlos Ramirez are always available to help students. All three LMS counselors are committed to working together to meet the unique needs of adolescent children. 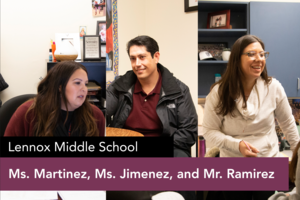 They are vital members of the LMS management team and students and staff members alike count on them for their calming presence and sage advice. They are thankful for having the opportunity to work within a great leadership team because everyone is supportive and they can all count on each other. When speaking to them, they all shared that the most rewarding part of the job is to see the students grow throughout middle school and work towards their goals.